The Earring of the Month Club by Diva Dangler is the perfect way to send yourself or someone else a fabulous surprise each month. For only $9.95/month, they’ll ship a gorgeous pair of earrings right to your home, office or dorm room. You even get a free pair of silver earrings when you join, so if you join for 1 month, you’ll get two pairs of earrings! Of course, the deal below is better, so check it out first! The Earring of the Month Club is a great way to stay up to date with the latest in earring fashion because the Divas at Diva Dangler follow all the latest trends. The earrings are so flattering and make you look beautiful. 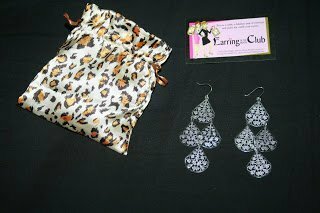 The Earring Club makes the perfect gift that keeps on giving for a birthday or the holidays…they are shipped in a cute leopard silk gift pouch. Parents, if you have a daughter in college, sign her up for the Earring of the Month Club and they’ll send the earrings right to her dorm or apartment…so she’ll be reminded that you’re thinking of her month after month. There is no minimum number of months and customers can cancel at any time. They also have a 100% LOVE IT guarantee! These are the earrings I received for review. They are very pretty and extremely light. One thing I hate is when my earrings feel like they are pulling my ear off, but that’s not an issue with these! They would be great with formal wear or just with a going out look. I also love that they came in an adorable little bag! Use Code ZOO and you’ll get free shipping for the life of the Club plus 2 months free! I received one or more of the products mentioned above for free using Earring of the Month Club. Regardless, I only recommend products or services I use personally and believe will be good for my readers. You don’t want to miss our review of the Apollo Surprise Box either! They’ve got some awesome products and you can follow our links to some awesome jewelry!